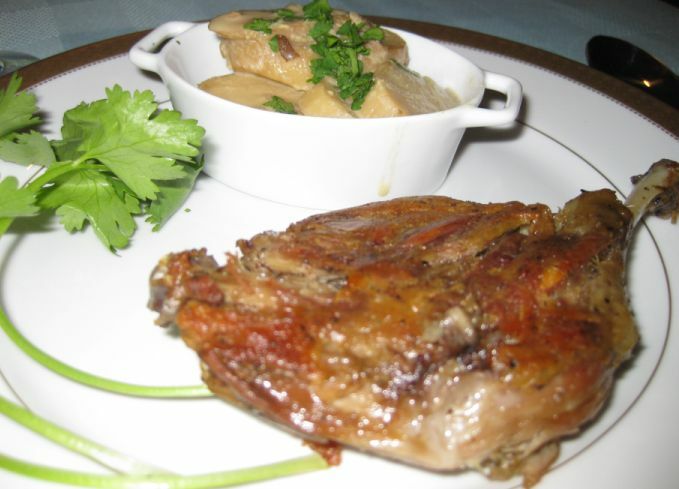 Confit simply means meat, such as duck or goose, that has been salted and then cooked and preserved in its own fat. 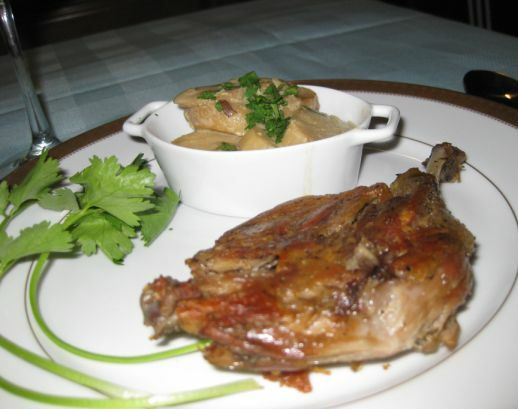 Duck Confit is not difficult to make but it takes a long time to cook the meat. 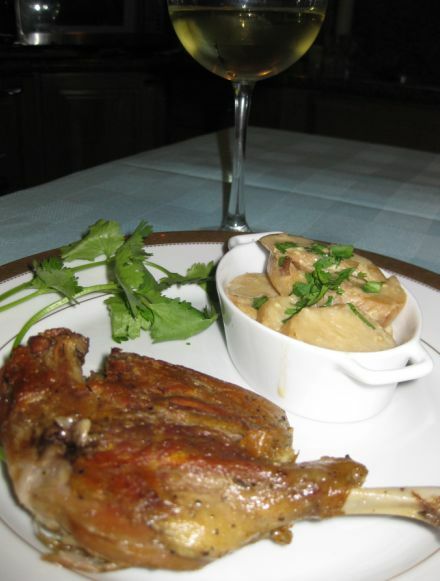 To prepare a confit, the meat is rubbed with salt and garlic, then covered and refrigerated for up to 36 hours. 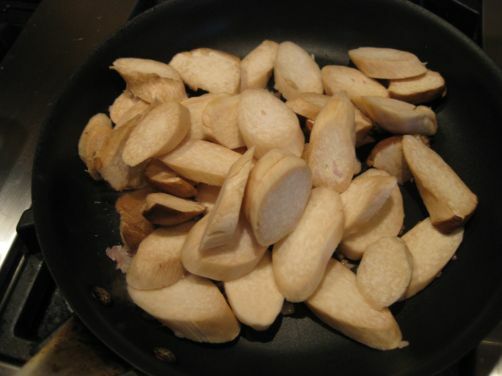 Salt is used as a curing agent and acts as a preservative. The meat is then slowly cooked in it own fat for as little as 90 minutes or as long as 10 hours. 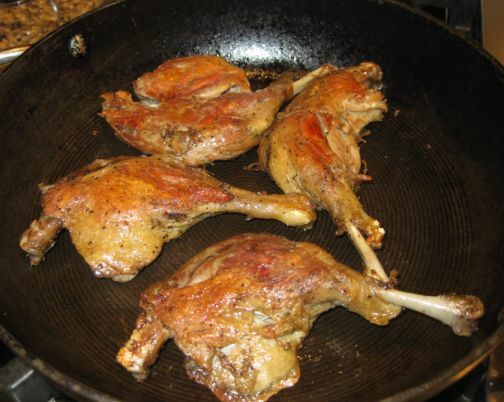 I opted to buy my duck confit because I don't see myself cooking the meat for 10 hours. 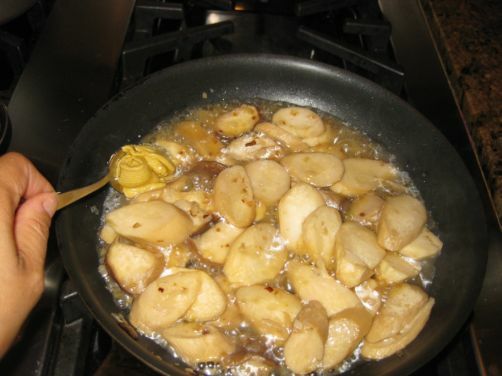 A classic recipe is to fry or grill the legs in a bit of the fat till they are well-browned and crisp, and use more of the fat to roast some potatoes and garlic as an accompaniment. Since I did not have any potatoes laying around I sautéed some King Oyster mushrooms with mustard and cream sauce to go with the Duck Confit . 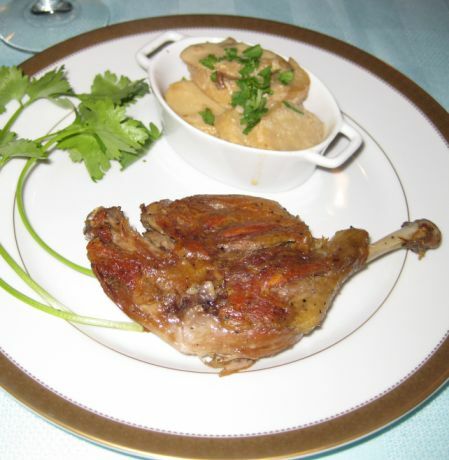 I love Duck confit because the outside layer is crispy and the inside is tender and should melt in your mouth. Close up look at the Duck Confit. 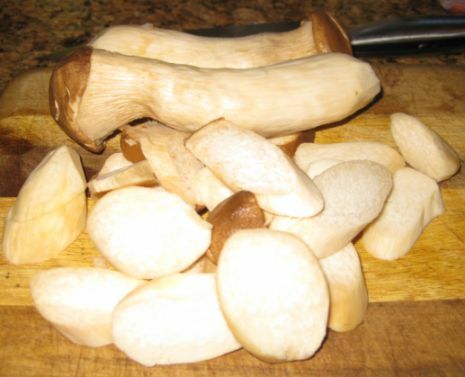 Slicing some King Oyster mushrooms. 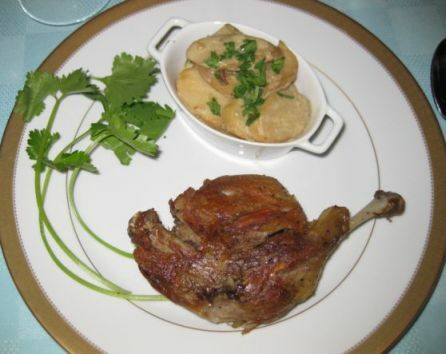 IN Vietnamese the King Oyster mushroom is called "mam duy ga" which translate to chicken leg mushroom. That is a funny name for a mushroom! 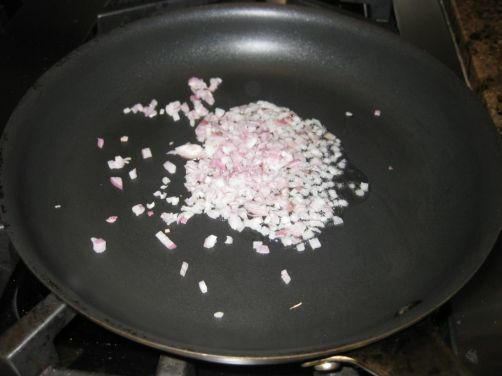 Sautéing some chopped shallots on a medium heat pan. 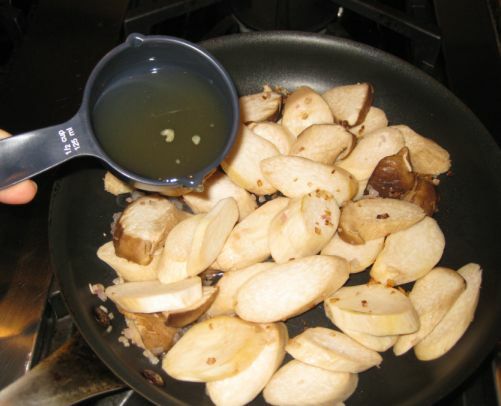 Adding the mushrooms to the sautéed shallots. 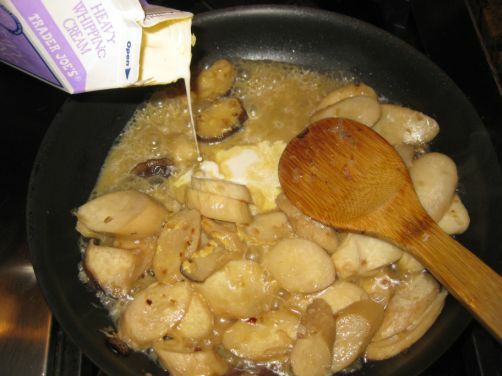 Adding half a cup of chicken broth to the mushrooms. 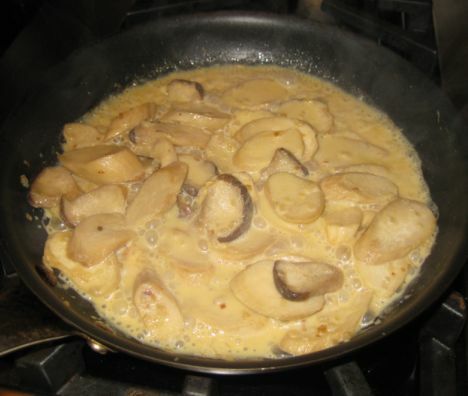 When the mushrooms released their juices, a table spoon of mustard is added to the pan. Bringing the pan to a boil and then it will be kept aside until the duck confit is ready. I was able to find the Duck confit at Costco so I decided to try it out. Open the package and all you need to do is to put the leg on a medium to low heat pan. 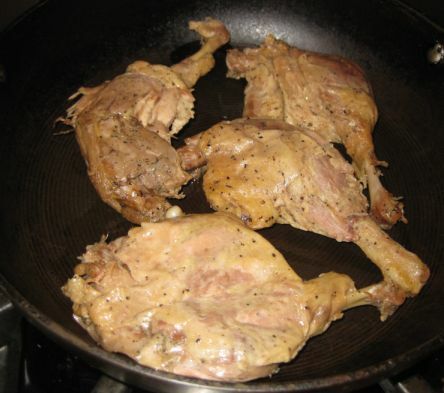 The legs are pan fried for about 5 minutes on each side or until brown, golden and crispy!